The Oh Really » Older Lady with Dyed Blonde Hair I Saw at the Bottletree Bakery A Few Weekends Ago, Complete with Hairnet, Extraneous Barrettes, Et Al. Also, Project Runway is Rad. | Home | Temporary ADD. Older Lady with Dyed Blonde Hair I Saw at the Bottletree Bakery A Few Weekends Ago, Complete with Hairnet, Extraneous Barrettes, Et Al. This entry was posted on Friday, July 28th, 2006 at 3:06 pm and is filed under sally. You can follow any responses to this entry through the RSS 2.0 feed. Both comments and pings are currently closed. I may have seen her at my gym. Is she kind of petite? I guess she was kind of petite — she was old. And HAD A HAIR NET AND LOTS OF BARRETTES. I don’t know how to draw wrinkles. That has to be her. 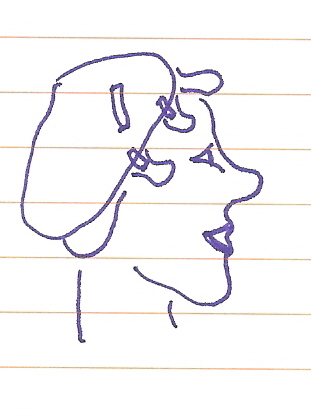 I mean, there ARE lots of freaks in O-town, especially at Bottletree, but I’ve only really seen ONE petite-wrinkled woman in a hairnet, so it must be the same person. Which would indicate that, yes, she also wears said net and barettes to the gym, while doing her cardio. Which totally weirds me out. Scratch my name on your arm with a fountain pen and then email me at theohreally at gmail.